Valve is currently preparing the launch of Portal 2 DLC to be released in summer 2011. Valve released Portal 2 on April 19 to fans that snatched it up and have probably been ravenously searching for the next "the cake is a lie" meme. Nothing has surfaced quite yet, but perhaps it'll come from DLC that will likely hit digital shelves in summer. 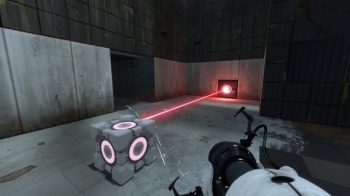 In an interview with Fast Company, Valve VP of marketing Doug Lombardi confirmed that along with turrets and weighted cubes, Portal 2 DLC is definitely coming down the Aperture Science pneumatic pipe network. "We will be announcing some DLC for [Portal 2]," he said. "So folks can keep a look out for more content coming this summer." Additionally, Lombardi revealed that we'll hear about this DLC in "about a week or so." There already is DLC available for Portal 2, but only in the form of cosmetic alterations to the game's co-op mode robots, such as hats and accessories. The DLC coming in summer is likely not another wave of robot tutus, as Lombardi also said that Valve will be supporting it with "more videos or more comics," referring to the Aperture funding requests and amazing Portal 2 comic that supported the launch of the main game. Knowing Valve, it'll probably associate the DLC with some kind of alternate-reality game too. The launch of Portal 2's was led up to with an ARG that gave fans the power to get the game released early, and it wasn't Valve's first. It'd be pretty surprising if there wasn't another ARG hooked up to Portal 2's DLC. As for what'll be in the DLC package, that's anyone's guess. More co-op levels? A trip into Aperture's past? A look at what Doug Rattmann (from the Portal 2 comic) was up to during the game? I choose option 3, if anyone's listening.